LCBO stats – Holy Fuzion Batman! A recent study showed that 87% of statistics are misleading and the other 13% are made up. These are some real LCBO sales stats from Wine Align. Fuzion! In 2008 I got a call from my friend Roger and got on the Fuzion bandwagon for a week. Then I asked myself, “Do I want to drink the same wine all the time?”. I guess some people do that. But isn’t that like buying a Costco sized pack of banana popsicles instead of the variety pack? Yes your freezer is full but I think you’ve missed the point of popsicle buying. 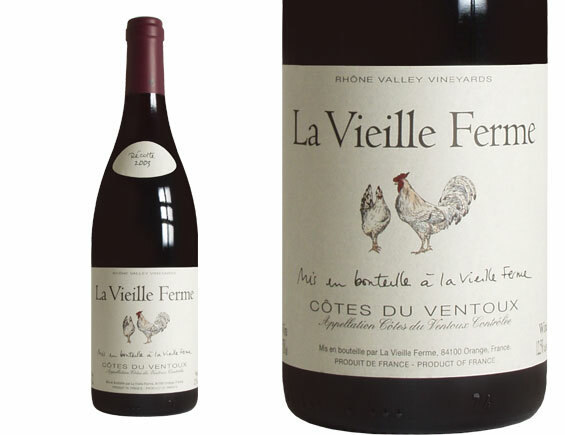 It’s a good value wine – especially at $7.45 – but not worth all of my palate all the time. Here’s my variety pack – Nero D’Avola, MezzoMondo Negroamaro Salento, Pelee Island Gamay Noir, and there’s not a banana flavoured wine among them. 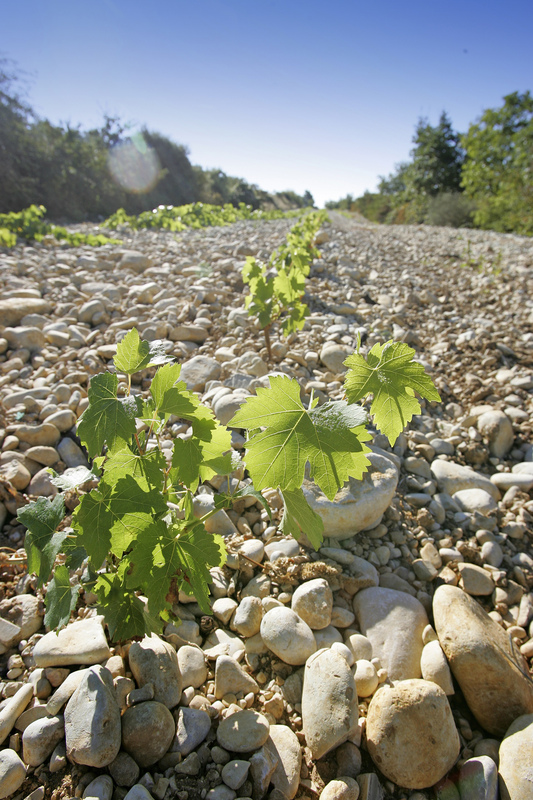 Southern Rhone terroir - would you start farming here? 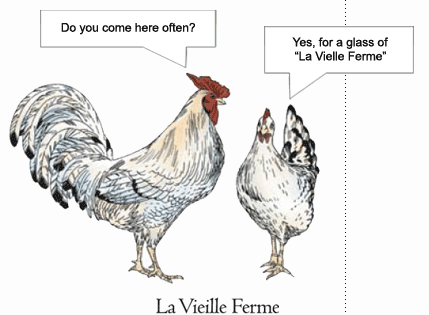 I love the wines of the Southern Rhone. In fact the spectacular Chateauneuf du Pape ($$$), Gigondas ($$), and Vacqueyras ($) wines are from this region. 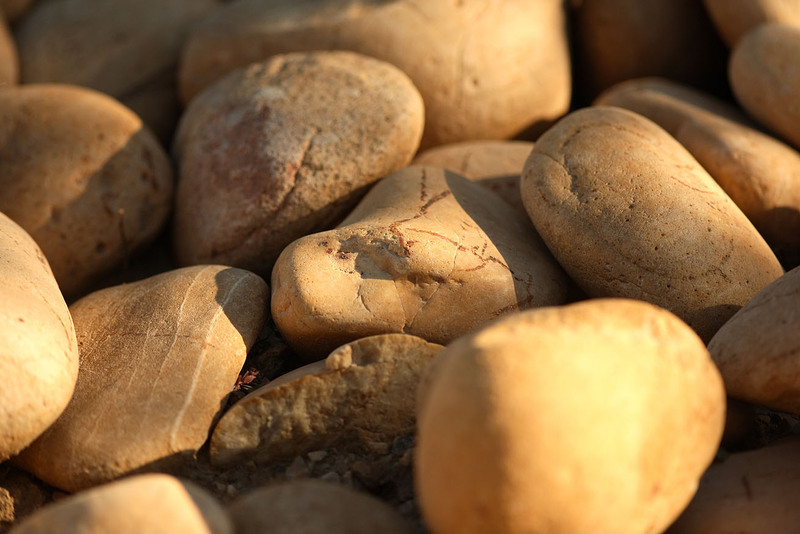 However, take a close look at the terroir – we call it dirt (the French really do have a way with words). The farmers grow grapes in this! Who was the first guy to think that would work? When I think of growing something I think of my grade 9 Geography teacher (doesn’t grade 9 Terroir sound more interesting) who taught me the words humus and loam. That’s what you look for if you are starting a farm. If you look closely in the next photo you might see some dirt – it’s hard to see. I love that wine grows in this “soil”. 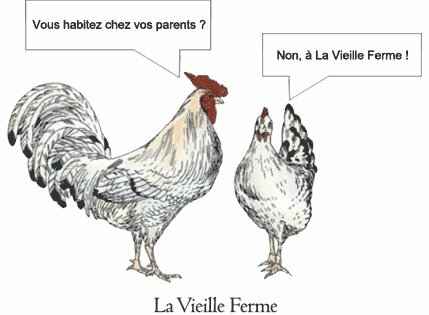 Fantastique. What will the French think of next? Can you see the dirt? I played a Blind tasting game with my friends Friday night! We all brought a “bistro red” that cost around $12. 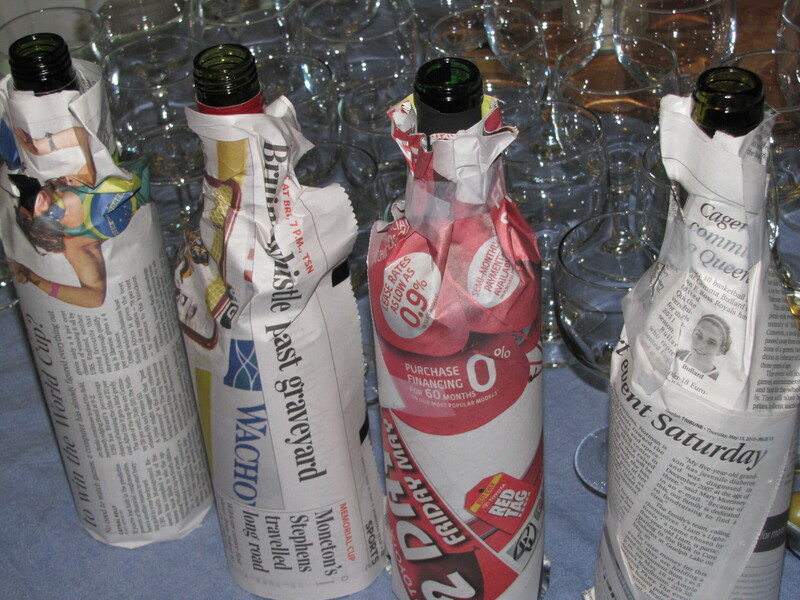 We wrapped them in newspaper, poured them, drank them and voted on them. It was fun but also a little scary as I suspected that everyone else at the table had a better palate than I did – that’s a lot of pressure as the only person there who writes a wine blog. 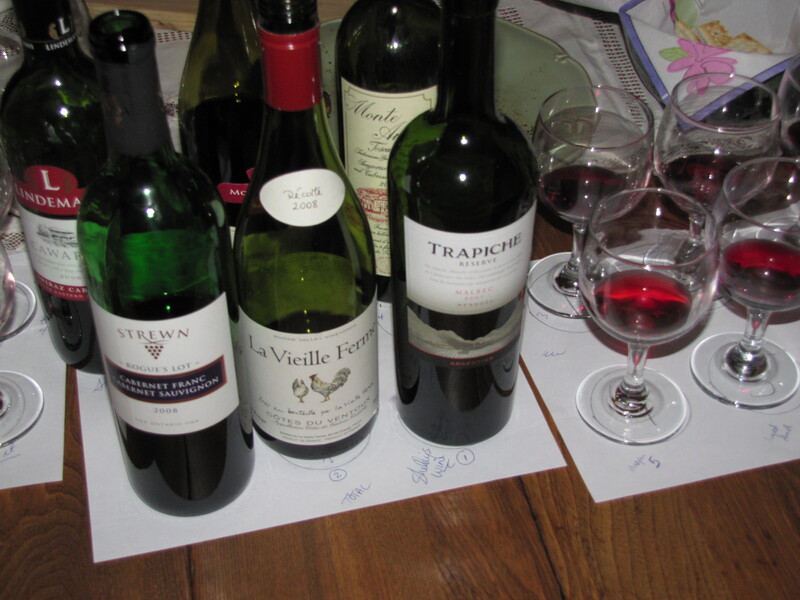 Seven of us ranked the wines and then cast our votes to find the winner and the results were interesting. My personal favorite (and I was alone on this one) – Monte Antico, Toscana Vintages 069377 | $ 14.95 At least Wine Spectator supported me by scoring it a 90 even if nobody else loved it. Other notes of interest – The top two wines scored well ahead of the other four. Also, four of the six wines recieved a first place vote! I got this idea from a wine bar in San Francisco that does this every Tuesday night. We ended up with 7 people to blind taste 6 wines. 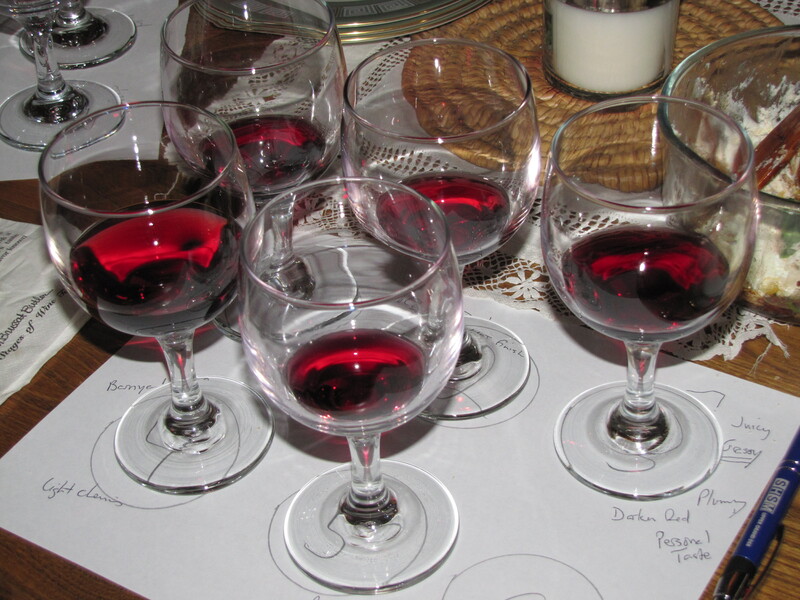 The wines were brought by the guests and were all in the “bistro red” category. The price point averaged about $12. Everybody knew a little something about wine – one couple even subscribes to Wine Spectator. I was actually afraid that they might sandbag the event by bringing a $40 Shiraz but they played fair in the end and brought my favorite. 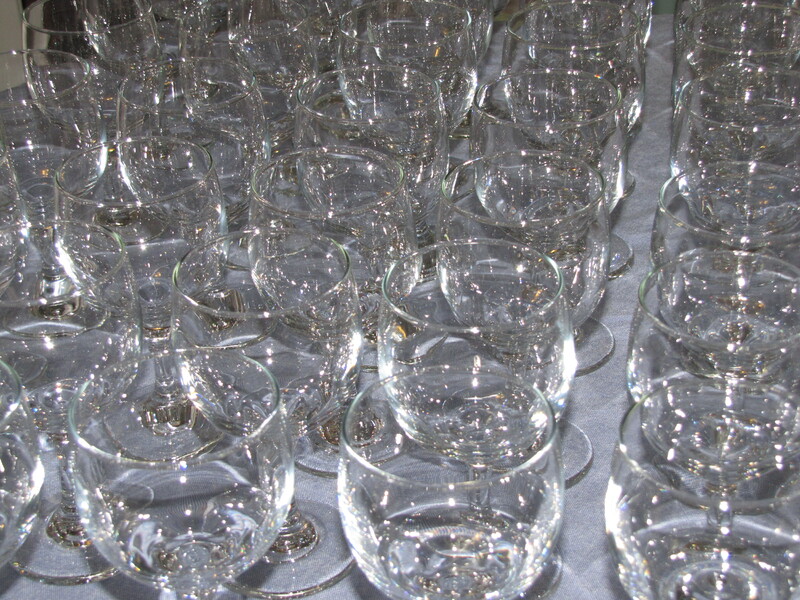 4 dozen wine glasses were rented (so that we didn’t resort to coloured plastic Ikea cups). The pours began and the wines were scrutinized. There were some interesting results. One wine smelled like “pickle juice” – but tasted better than that. The wine that I liked best nobody else liked (not a good sign for a blogger – my only consolation was afterwards when I learned that Robert Parker Jr. gave it a 90 – good for me). The Ontario wine stood up well to the competition but in the end a French Cotes du Rhone got 4 out of 7 first place votes! Full results will be posted later this week. I know, I know – “ooh you’re telling us a story about the time you went to Lake Como”. And now you think I’m a pretentious world traveller. I’m okay with all that. I learned that when you don’t understand a culture things can appear tacky that really aren’t. Cantina Follie seems like such a ridiculous name in English and their logo, a laughing wine cask, seemed like a SNL parody of German humour (Mike Meyers as Dieter in his talk show Sprockets). However, this Cantina was my highlight of Lake Como. We walked past a narrow alleyway with lots of steps in it and my daughter noticed the silly barrel with a funny face on it. What we found was a great wine store with a tasting room and our host, Joost. Originally from Holland, Joost was as enthusiastic about his wine as I was to listen. It was Joost that introduced me to Salice Salentino – I now pick up a bottle every time Vintages carries one. Despite the unfortunate barrel logo, this wine bar was the highlight of our dining in Lake Como. 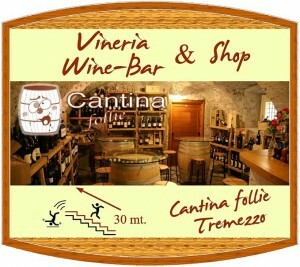 Up the stairs from the main street, hidden in a cave is the Cantina Follie. The staff knew their wine and had over 300 Italian labels. The patio had a nice selection of wines by the glass at a very inexpensive price (2.50 Euro per glass) which included tapas. Let the owner suggest his favorites and buy a bottle on your way out. You MUST visit this wine bar if you are in Como. On your way out stop at the Red and White Bar and order the pita with brie, rocket, and speck to take back to your hotel (you might want to order 2).